From the banks of Hawes Water an old track rises East between Hare Shaw and Selside and on to Swindale. This is the ‘Old Corpse Road’: the villagers of Mardale Green had no consecrated ground in which to bury their dead, and so had to carry those they had lost the long, hard miles to the next valley for burial. Mardale Green is long gone – flooded when Hawes Water was created in the 30s – but the old track remains. 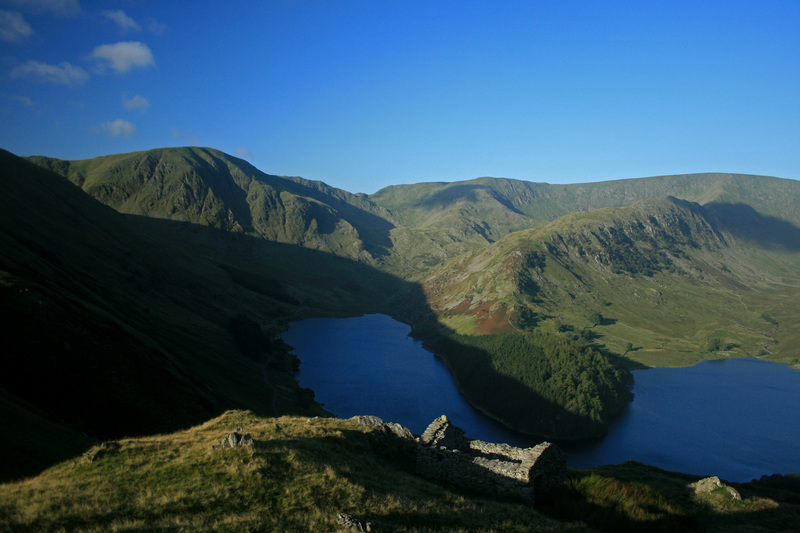 A few hundred feet above the lake, the Road takes a turn past two shattered shepherds’ huts, which sit crumbling, surrounded on all sides by the crags, cliffs and soaring ridges of Mardale. Most visitors’ experience of the modern Lake District is of a gentle, domesticated space, of lush pastoral land cupped in the hands of rounded hills, of primly lovely villages, of calm lakes leisurely navigated by steamers, of tea shops and chocolate boxes. But standing by those shepherd’s huts on the Corpse Road, those lowly, isolated shacks that, for some, would have been home for weeks at a stretch, set me thinking about another Lake District, another landscape – ancient Cumberland, a tiny kingdom filled with high mountains and remote valleys, whose people carved their lives, and their livings, out of a lonely and sometimes inimical landscape. It is this other Lake District that has particularly inspired my photography. I have sought to capture the wildness that can easily be over-looked in the midst of the tourist bustle of Ambleside and Keswick, where the fells are just a gentle back-drop to a leisurely day out. This is a wild and remote space, a dangerous, lovely space, where you need to take your beauty raw.